Since they're going to be so many girls sprites and stuff in the game I thought it would be a good to to have them saved as files outside of the game so they won't always be in memory, so I recently started exporting the character sprites outside the game. Basically, the idea is loading/unloading sprites "on the fly" between areas which should (hopefully) improve the game's performance on older pcs quite a bit and lower the game's system requirements(it would seem the problem was caused by higher memory usage). As of right now, it can do this without any noticeable speed slowdown. Above are 3 images re-sized from a 3DCG snapshot to a smaller size for the game. 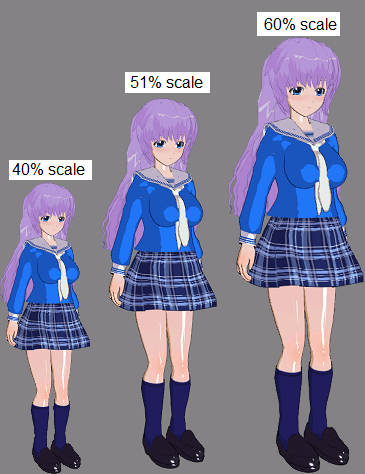 Currently the game only uses character images shrink down to 40% of the original scale(like in the image above). However, I think it's now possible to use a bigger sprites(like the 51% or 60% scale). But in order to use a larger image, the game must zoom-in more or the character's scale compared to the map would be off. So the larger the image, the fewer of the surrounding you can see while zoomed-in(like you'll see less girls because the camera is zoomed-in on one character so much, though I guess zoom-in is suppose to focus on fewer characters...). I'm wondering what you guys think about the current zoom and about if I should increase it even more. I could use the larger 60% scaled sprites, but I rather liked being able to see a little bit more of your surroundings while zoom in. I could also go in-between that and the current 40% and use (around) 51% scaled sprites for a bit more quality, showing a bit more of the surroundings. Or I could just keep it at the current nice 40% sprites. Another idea which I'm considering, is using 2 zooms, zoom-in once to the 40% sprite and then be able to zoom-in again to 60% sprites, I rather like this idea because it keeps the current zoom of the game and add another one too, but if I did use this I'll to have shrink and save each image twice(one 40% and one 60%). When your viewing the game zoomed-in, you will see the characters(at the size of the 40% scale sprites) clearly like that, and when not zoomed-in the game just uses autoscaling to figure out how to draw the sprites. If you're wondering, I originally decided to on 40% sprites because there was going to be so many girls and I guess it seemed like a nice size. Anyways I haven't decided just yet on what to do about the sprite size but I'll let you'll know soon on what I decide since I need to get this before I can put anymore sprites into the game. But the most important part of the game though is the probably the gameplay itself.